little bee books, 9781499801026, 40pp. Cockatoo. Cockatoo two? Cockatoo, too? Two cockatoos! Two cockatoos, too? Cockatoo tutus! Two cockatoos meet two more cockatoos in tutus and two tutued toucans. And then two more! Can they all can-can? They can! The cockatoos and toucans join together for a dance and ask the reader: "Can you can-can too?" 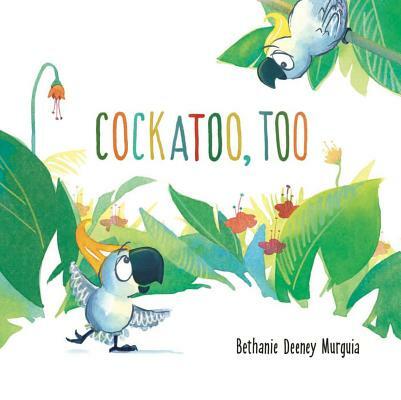 Bethanie Deeney Murguia's fabulous book combines fantastically funny wordplay with lush, vibrant illustrations that will make readers want to can-can along! Bethanie Deeney Murguia graduated from the School of Visual Arts in New York City with an MFA in Illustration and has created numerous picture books, including Zoe Gets Ready, Snippet the Early Riser, and I Feel Five. She now lives in the San Francisco Bay area with her two daughters and her dog Disco. To learn more about Bethanie, please visit her website: aquapup.com. Murguia's (&lt;i&gt;I Feel Five!&lt;/i&gt;) featherlight divertissement blends elegant artwork and wordplay to ponder. The setting: a jungle of blue-green fronds and exotic flowers. Layers of foliage fade toward the back, creating a sense of misty depth. The star is a small cockatoo-sad-eyed and stumpy-legged, with an orange crest and a beak like a droopy moustache. "Cockatoo," it announces, facing front and raising its wings in introduction. A page turn reveals two legs descending from the top of the page as the cockatoo looks up suspiciously. The new arrival, also a cockatoo, has a yellow crest. "Cockatoo, too?" "Two cockatoos!" they cry, joining wings and taking a dance step. Two more sets of legs appear. "Two cockatoos, too?" The punning continues as tutus are donned for a performance, and the arrival of a line of dancing toucans pushes the wordplay still further: "Tutued toucans can-can."